"Retail sales slide as shoppers tighten purse strings before Brexit. Volumes fall 0.5% in October as gloom engulfs high street amid growing jitters over EU divorce", wailed the headline and standfirst in The Guardian, commenting on the Office for National Statistics' latest test of the pulse of UK retail. Aside from the usual 'jittery shoppers' line, others also came up with the 'holding back for Black Friday' argument, ignoring the fact that the discount event happened last year too and the year before that. The first thing to note is that retail sales did not fall. The only meaningful comparison is not with the month before, but with the same month last year. On that basis, total retail sales in value terms were up 4.0% on October 2017 and even without the effect of inflation, volumes were up 2.2%. That is a pretty weird definition of 'gloom engulfing the high street'. Growth might be slower than during the summer, when UK consumers partied hard because of the football and the royal wedding and had barbecues in the hot and sunny weather, but it is still there. There are two explanations for this mild slowdown. The first is the weather, which was mild, sunny and dry. This always holds back fashion sales as people delay buying heavy winter coats, jackets and boots etc. 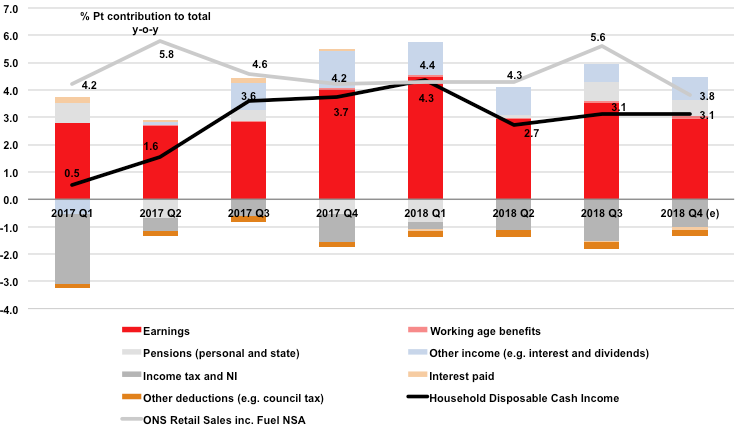 The second is that UK households have been spending ahead of disposable income growth for a long time as the jobs market has gone from strength to strength and unemployment has continued to fall to record low levels. They have consequently run down the amount they add to their savings each month and borrowed more in terms of credit cards and personal loans. Far from holding back due to 'jitters', they have actually been spending like drunken sailors on shore leave. At some point, this has to come to an end. This summer's partying marked a postponement of the day of reckoning, when consumers have to start spending within their means. But some time soon, probably in the next couple of quarters, it will arrive. Then shoppers will retrench heavily, the main risk being from the jobs market. However, October was merely a temporary slowdown, not the big correction that is long overdue. Want to receive the ConsumerCast blog in your inbox? By subscribing to our mailing list you will always be updated with the latest analysis and opinions through the ConsumerCast blog. Consumercast © 2019 All rights reserved.